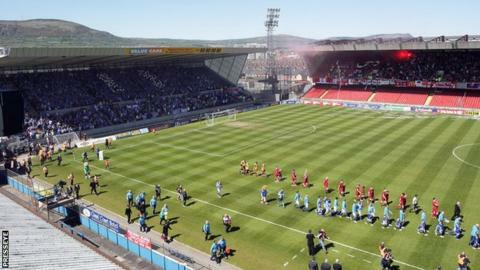 Linfield will face "severe punitive sanctions" if its fans sing the song known as 'the Billy Boys' at matches. The Irish FA has warned the Windsor Park club that the singing of all variations of the song could lead to games being played behind closed doors. Linfield said punishment for fans singing the song includes being referred to the PSNI for prosecution. The club added that this applied to "any other song or chant that is undeniably sectarian or offensive". The move comes after Linfield and Cliftonville successfully appealed punishments dealt out out by the Irish FA over sectarian chanting at the County Antrim Shield semi-final at Windsor Park last October. The IFA Appeals Committee also ruled that the evidence against Cliftonville had not been strong enough. In a statement released on Wednesday, Linfield gave advice to supporters. "All variations of the song popularly known as 'the Billy Boys' and sung to the tune of 'Marching Through Georgia' are now deemed unacceptable and, if aired at Linfield matches, will lead to severe punitive sanctions against the club," they said. "Any supporter found to be singing this song in any of its forms will be subject to serious sanction including ejection from the ground, a lifetime ban from Linfield matches; and being referred to the Police Service of Northern Ireland for prosecution. "This will include other songs sung to the same tune, any use of the tune itself, and will also include those versions using words that may not be seen to be inherently sectarian in their nature." Linfield have described the IFA disciplinary process as "not fit for purpose in what we are constantly being told is a "post-conflict society". "Local football requires political and state guidance that provides us with the legal support framework to remove this problem from our game."